If you follow me closely on Instagram, then you probably know that at the beginning of this year I started to move towards making better decisions concerning my health and fitness routine. Other than being more active and taking better care of myself mentally and physically, a huge lifestyle change I made was a difference in my diet. Now I've never been particularly fond of eating red meat or drinking cow's milk, so in January I decided to cut back and now I'm at a point where I don't eat any red meat or poultry at all. There have been a few times where I will have dairy occasionally (AKA ice cream cravings), but for the most part, I've cut out milk, cheese, yogurt, butter and eggs as well. While I know there are a ton of arguments out there when it comes to leaving out meat and dairy in your diet, I think it's really important to listen to your body and feed it what it wants. I've personally never really felt the best eating red meat or poultry (I tended to feel really lethargic and heavy afterwards) and eating dairy has honestly always left me with an upset stomach, so I primarily eat a plant-based diet accompanied with seafood now. 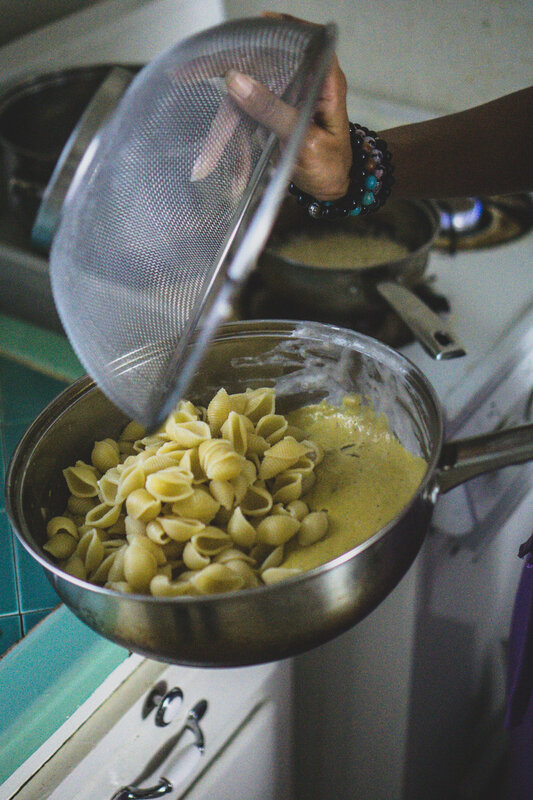 As this lifestyle choice does tend to make it difficult when it comes to cooking up a variety meals for myself, I often found myself resorting to buying creative but pricy meals at vegan/vegetarian restaurants and just cooking simple seafood dishes at home. A couple of months ago, I found a meal delivery service called Purple Carrot and that has been a serious game-changer for me. Yes, Purple Carrot is 100% plant-based/vegan, and no, I'm not 100% plant-based/vegan. However - since the only non-vegan "product" I typically eat is fish and I honestly love vegan food, I still 100% like using this service. What I like about it is that I have the feeling of getting a restaurant quality meal that (1) fits my lifestyle, (2) fits my budget, and (3) I can make at home again and again. The awesome thing about Purple Carrot is that you can have it delivered straight to your door weekly. The plan I've been on is the 1-2 person plan (since it's just me and the hubs), which gives us three unique meals to make per week. That means three meals a week where we don't have to bicker about what restaurant we're going for dinner or scramble to pick up the ingredients we forgot to grab at the grocery store (we always do that believe it or not). Another thing that I really like about this meal service is how inventive the recipes are. I wouldn't call myself the best cook, and I'm definitely not the most innovative when it comes to being in the kitchen, so it's always really fun to look through my Purple Carrot box and see the types of recipes in there. 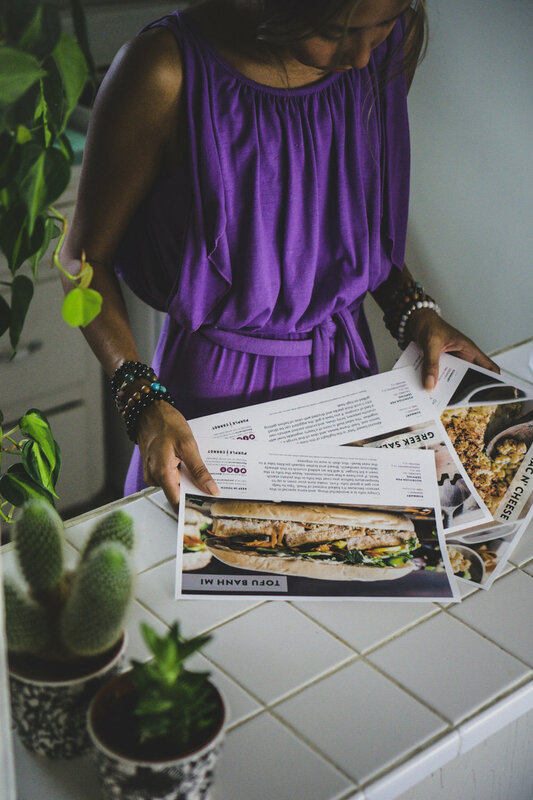 Each recipe card is easy to follow and very detailed - so even after you've made the meal once, you can always just pick up the ingredients at the store to make again. I mentioned before that I've cut out dairy for the most part, but it's been a bit of a struggle to give up cheese. (It's just so good.) Imagine my joy when one of the recipes in my box was for a creamy mac n' cheese dish! I have bought cheese alternatives at the grocery store in the past, but the selection is always really poor to be perfectly honest. 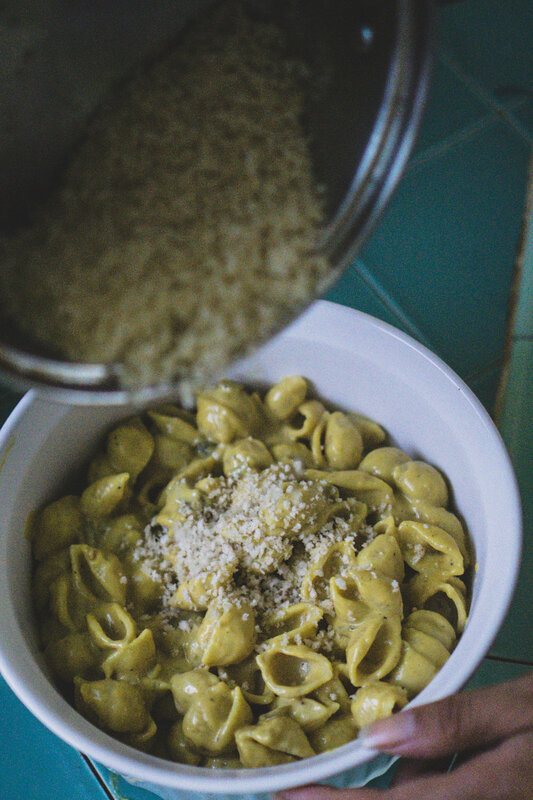 I've been experimenting with making my own dairy-free cheeses recently, but the "cheesy" sauce in this recipe wasn't something I'd tried to make yet though, so I was excited to try out the recipe. Like I said, I'm not the greatest cook - but Purple Carrot makes it SUPER easy to feel that way since all of the ingredients are already measured out. Pretty much all you have to do is put them together in the order on the recipe card. Each meal I've made from the service has never taken longer than an hour for me to make - and when you have a hectic schedule like mine, it's really nice to have a quality meal that's quick and simple. Lastly, I'm totally impressed with how appetizing each meal looks once I'm finished cooking. Seriously. My meals never look this pretty after I'm done in the kitchen (except for when I'm making a smoothie bowl, maybe). This blog post is sponsored by Purple Carrot, but all in all, I would definitely recommend trying it out if you're vegan/pescatarian/dairy-free. Even if you're none of those things, I would still say to give it a go! 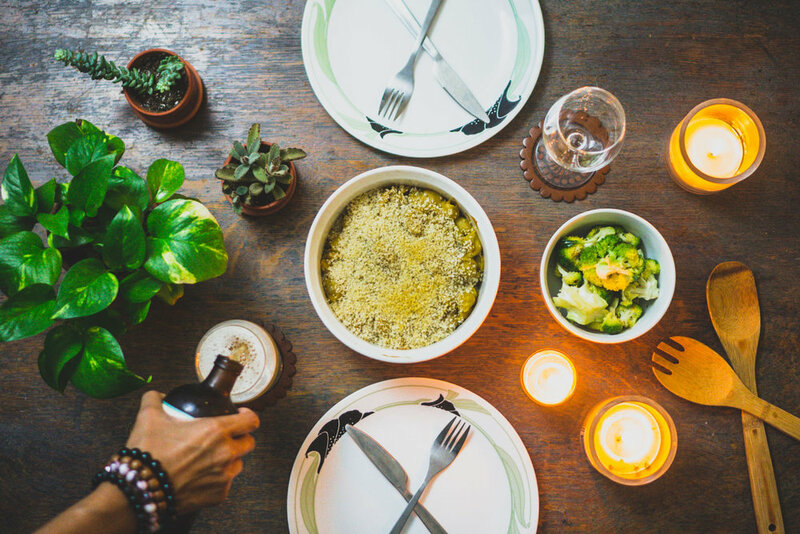 Eating out all the time can get pretty expensive over time, and why not try making some fun plant-based meals where you don't even have to come up with the recipes on your own or scour the store buying any of the ingredients? Seems like a win-win to me. 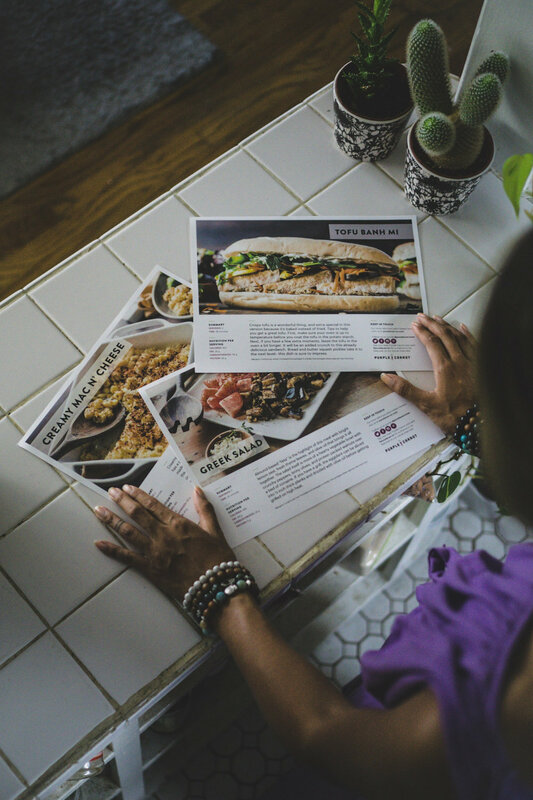 Sign up to try Purple Carrot at https://goo.gl/0xMn4A and receive $30 off your first delivery with the code "audrie" at checkout - happy eating!